Obviously, the City Hall reporting has taken a back seat the past couple of days because of the earthquake. Here are a couple of shots I took while I was out at Mt. SAC today. The first picture is of the bookstore, which is still closed. 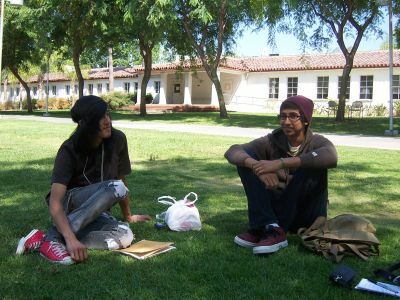 The second picture is of students, from left, Tony Hoang, 20, and Amish Sharma, who were sitting on the same place on the lawn yesterday when the earthquake hit. “We were sitting in two chairs and then it started rumbling. It was shifting back and forth. Then, it became a slow motion wave, and people started coming out of the buildings,” Hoang said. This entry was posted in Walnut by mngiadmin. Bookmark the permalink.